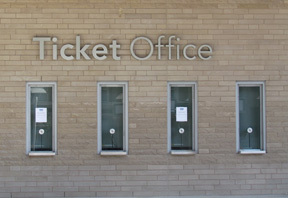 The Ticket Office is open on weekends only for events and when tickets go on sale. Weekend event hours: 12:00 PM (Noon) (or two hours before the doors open, whichever comes earlier) until approximately 30 minutes into the event. Weekend on-sale hours: Typically 10:00 AM - 12:00 PM. Please call the Ticket Office for specific hours. Tickets may be purchased in person at the Ford Center Ticket Office. Purchase tickets online at ticketmaster.com. Ticket purchases will go off-sale via Ticketmaster approximately 2 hours prior to door time for the event. A facility fee will be added to all tickets purchased at the Ford Center Ticket Office. Additional Ticketmaster service charges and handling fees are added to all tickets purchased online. All tickets are subject to availability. ADA Accessible seating is available at various locations around the arena. For more information, please contact the Ticket Office. Short-term parking is available on Main Street. For additional Ford Center parking information, click here. Tickets may be picked up at the Will Call window beginning two hours prior to the event. The customer must present photo ID and the credit card used to purchase the ticket. Tickets will only be released to the person whose name was provided with the ticket order. Upgraded tickets may be available on a show-by-show basis, at the discretion of the event promoter and the Ticket Office Manager. A strict No Refund or Exchanges policy will be enforced. For most shows, standard digital cameras are allowed. No video or professional lenses, please. Depending on the event, lines may be organized by first come-first served or by lottery. Only the person purchasing the tickets may come to the ticket window. Other guests may wait outside of the on-sale area. Cell phones may not be used while the customer is at the ticket window. Due to the number of ticket requests on Ticketmaster at the beginning on an on-sale, customers may only request “Best Available” seats. Specific section or row requests cannot be handled during the first hour of the on-sale. These policies will help the Ticket Office to offer you the best opportunity to purchase tickets for an event. Any other requests will be handled at the earliest possible opportunity. Due to the nature of the business, we host events that may sell out, so patrons sometimes go to the secondary market to purchase their tickets. Ford Center is not able to guarantee that these tickets are legitimate because they were not purchased from an official source. By purchasing these tickets, you might be the victim of scalping. We have encountered situations where a patron purchases tickets through one of these websites, and finds out that the tickets were counterfeit at the event, so they are not able to attend the show. Sometimes, while you may receive real event tickets, you end up paying more than face-value for these tickets. Ticketmaster is the official ticket provider of Ford Center. In order to avoid missing an event, you should NOT purchase tickets from secondary websites unless it is an approved vendor of Ford Center.